For Bargelink.com and Railcargo-Online.com we maintain flat rates. With a subscription, you can actively use the selected module, but also read all the details of incoming offers or requests. 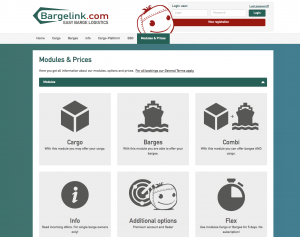 Bargelink does not charge other fees, commissions, rewards or simmilar. So no hidden costs! For all subscriptions our Terms & Conditions are applicable. Infos about Modules & Prices at Bargelink.com. Registration is also free of charge at Railcargo-Online.com. For companies with more than three branches, we offer individual solutions. Just contact us for more details. Entrepreneurship isn’t just a matter of turnover and profit: We are convinced, that it’s also a matter of corporate citizenship. That’s why we are active in our community and help people, who are in trouble though no own fault. With our engagement in Kiwanis and Rotary we support underprivileged children and youngsters. Beside our personal engagement we also help pecuniary: for every subscription for Bargelink.com or Railcargo-Online.com we donate € 5,00 per year to Kiwanis and Rotary.